The challenges facing public higher education are placing new demands and pressures on colleges and universities and those responsible for their governance and leadership. As higher education seeks to negotiate these and other 21st-century changes, the role of its “guardians” in stimulating change, supporting purposeful leadership, and restoring confidence has never been more critical. Yet when strong and effective governing boards are most needed, many boards have been weakened, and their capacity to fulfill guardian responsibilities is questionable. Boards can be no more effective than the character, competence, commitment, and dedication of their individual members. 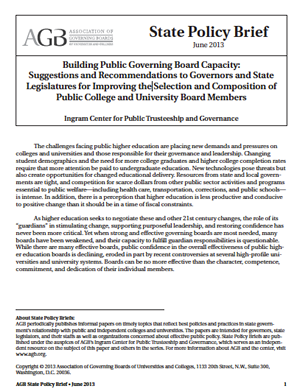 Building Public Governing Board Capacity: Suggestions and Recommendations to Governors and State Legislatures for Improving the Selection and Composition of Public College and University Board Members offers focused insight on best practices for board development.